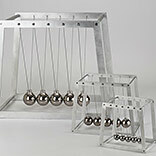 Welcome to the world's only source for high quality, larger-than-life Newton's Cradles! 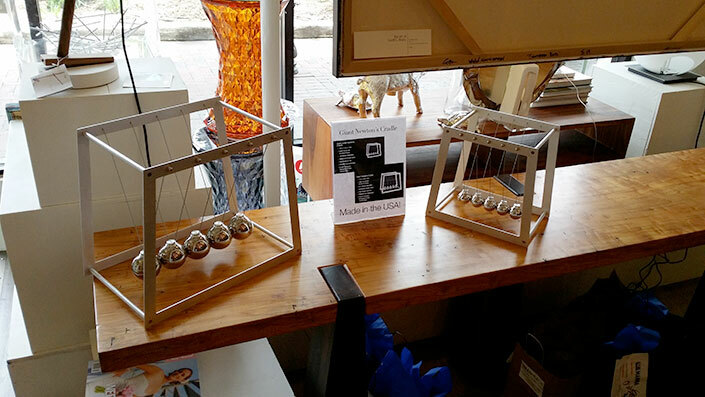 If you have ever wanted to buy a truly large, quality-made Newton's Cradle then you know that they are impossible to find – until now! 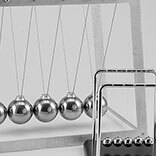 Before now the only types of Newton's Cradle available were small and cheaply made with plastic or wooden frames, thin fishing line and tiny balls that tangle easily and break prematurely. 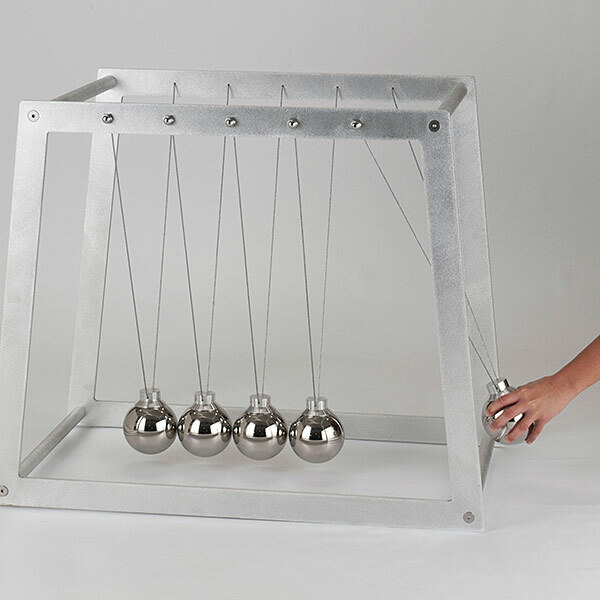 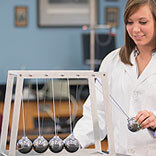 Finally, we've created a large Newton's Cradle that is made in the USA, truly high quality, and actually giant! We offer three sizes: Jumbo Giant, Giant, and Giant Junior. 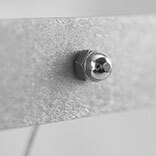 More than a novelty, our cradles are true pieces of art that are not only stunning to look at, but fully functional. 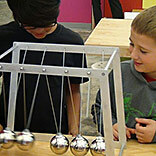 When we demonstrate our Newton's Cradles, our audiences can't believe how big they are in person. 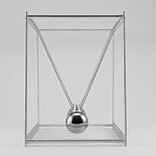 Our passion for this unique demonstrator drives us to produce a durable, beautiful cradle that will last a lifetime. 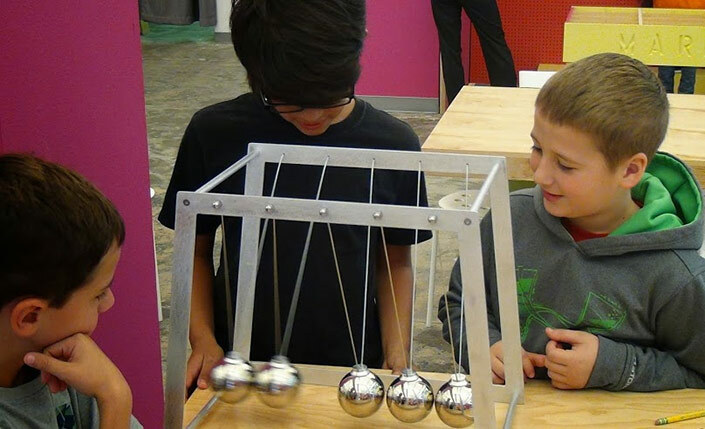 They meld form and function to make true works of art. 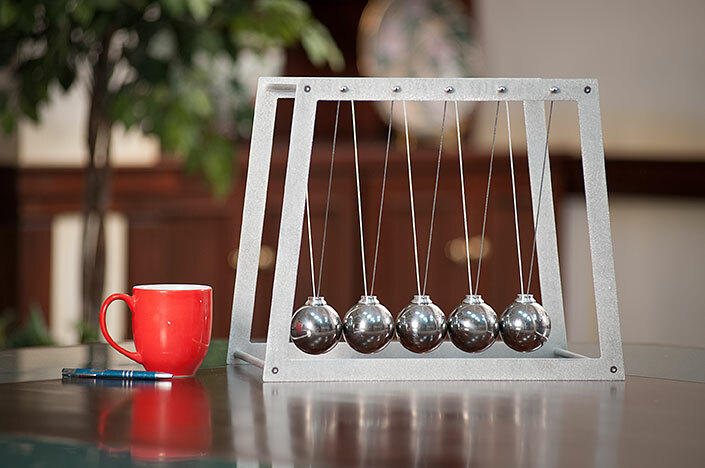 Our Newton's Cradles make great gifts and desk toys. 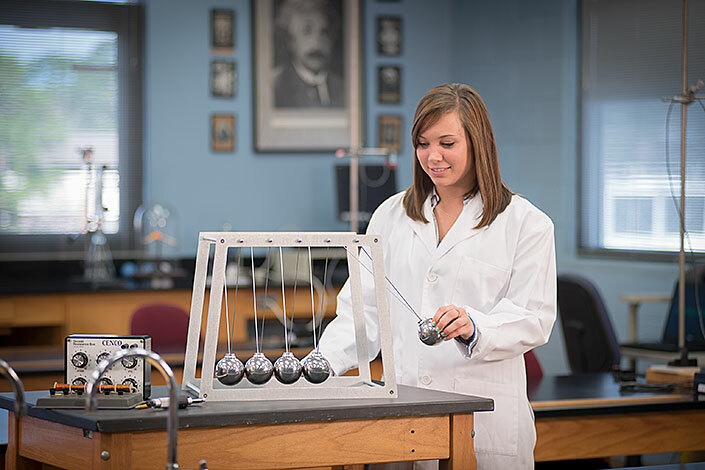 We look forward to hearing from you – and know that you will be amazed at just how cool a giant Newton's Cradle is when you receive yours. 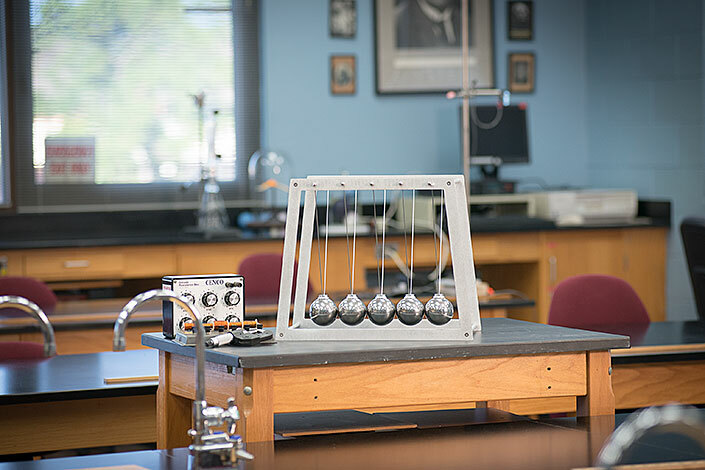 Newton's cradle, named after Sir Isaac Newton, is a device that demonstrates three main physics principles: conservation of energy, conservation of momentum and friction via a series of swinging spheres. 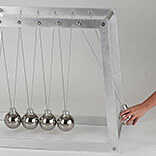 Most people think that Isaac Newton invented the apparatus commonly called a Newton’s Cradle, but he didn’t. 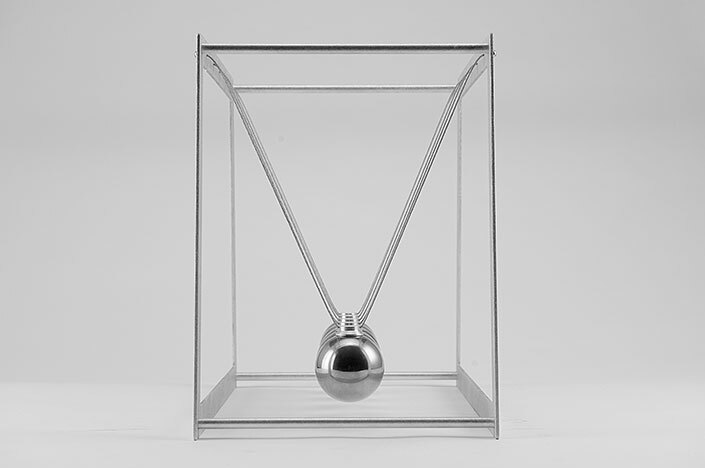 English actor Simon Prebble invented the device in 1967 and named it in honor of Newton. 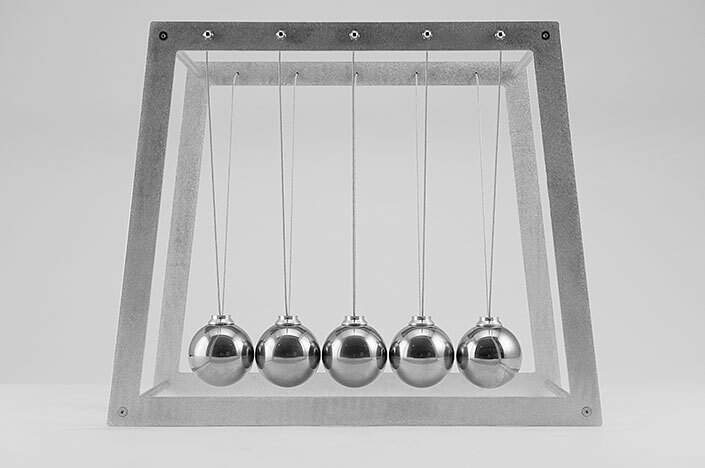 In 1968 the first portable version hit the market and quickly gained popularity around the world as a fun, educational physics demonstrator. 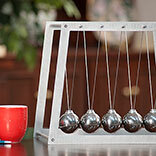 If one sphere is pulled back and is let go, it strikes the first sphere in the series and comes to nearly a dead stop. 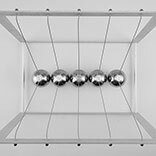 The sphere on the opposite side acquires most of the energy and almost instantly swings in an arc almost as high as the release height of the first sphere. 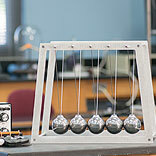 This shows that the last sphere receives most of the energy and momentum that was in the first sphere. 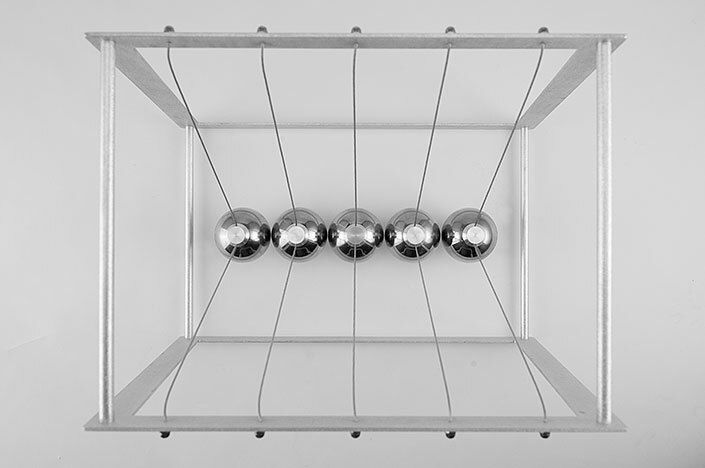 The impact produces a shock wave that propagates through the intermediate spheres. 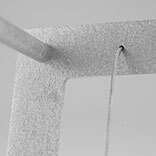 Any efficiently elastic material such as steel will do this as long as the kinetic energy is temporarily stored as potential energy in the compression of the material rather than being lost as heat. 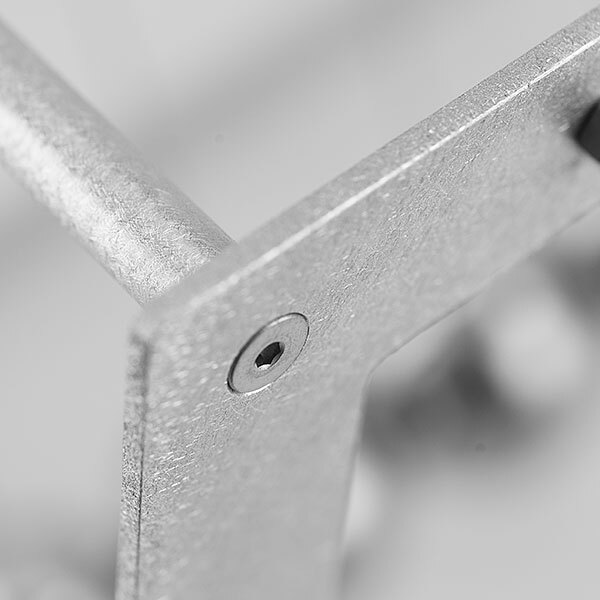 Our cradle parts are machined here in the USA with laser precision. 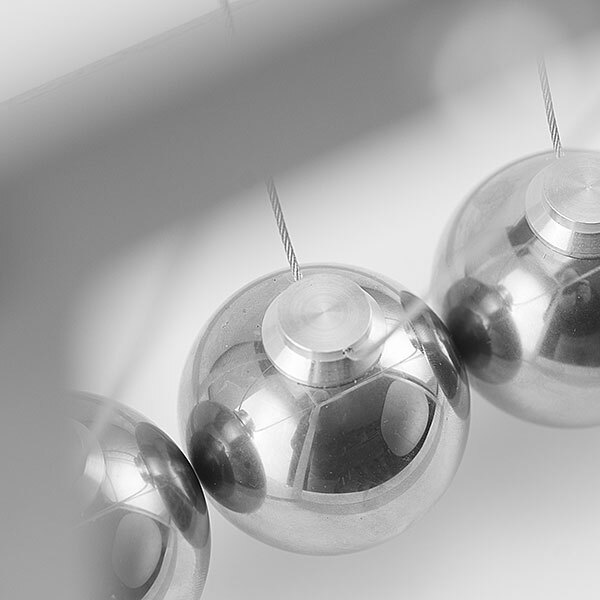 Precision parts equal precision swings that are fluid and smooth. 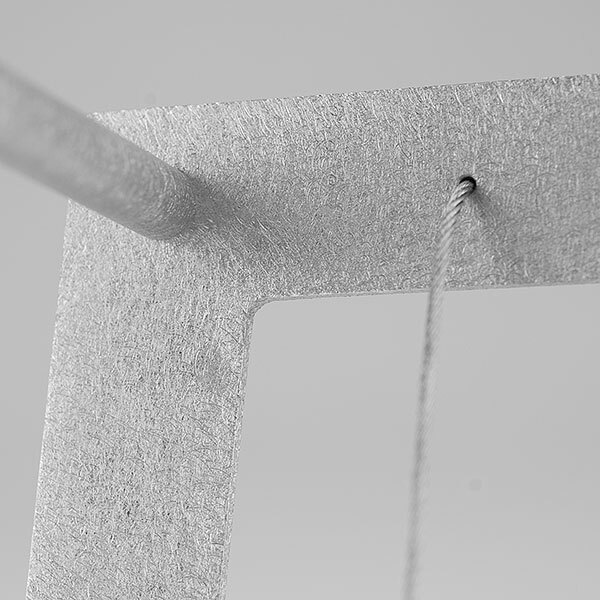 Each cradle is hand assembled and tuned for optimal motion. 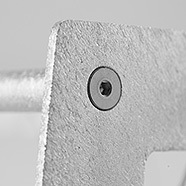 Stainless steel, countersink hex socket screws hold the frames tightly to ensure a stable platform. 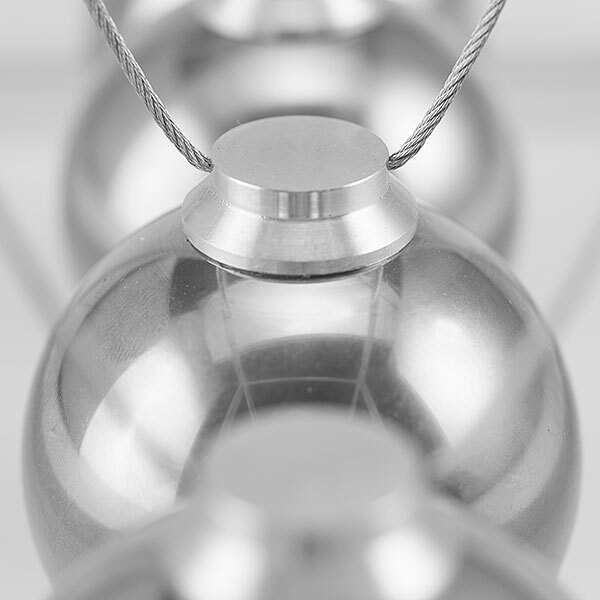 • Durability – It should stand up to long-time usage and remain in good condition. 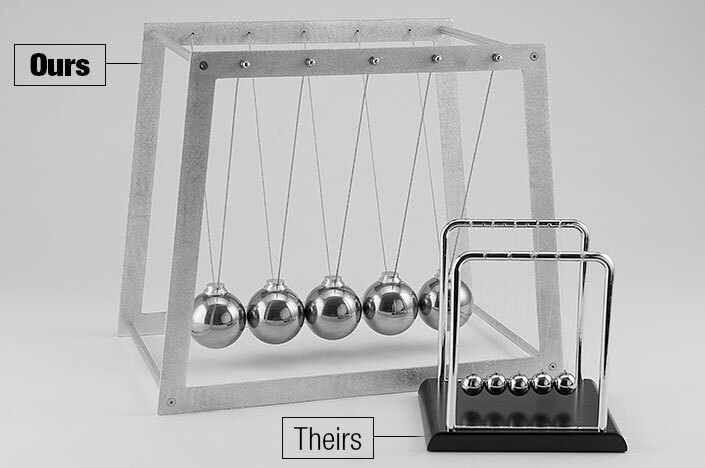 • Utility – It should function well when used. 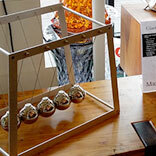 • Beauty – It should delight people and raise their spirits. “6061 t-6 aluminum” is used in the construction of aircraft structures because of its fatigue limit and high tensile strength. 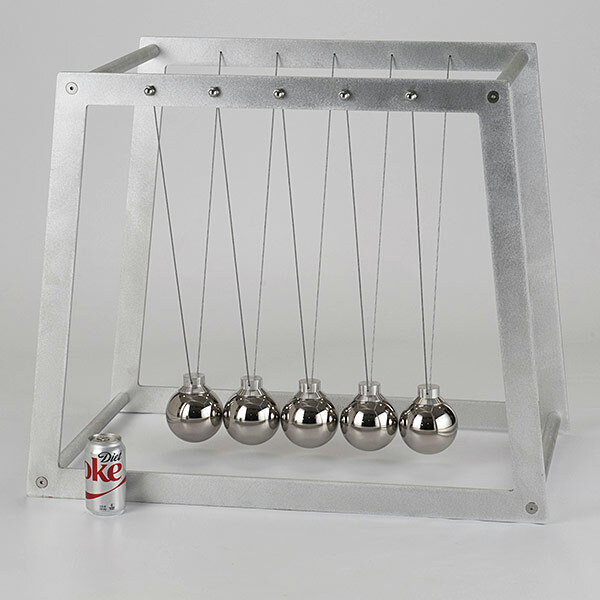 By using this same aluminum for the frames of the giant Newton’s Cradle we are able to build a solid foundation while making a stunning visual presentation. 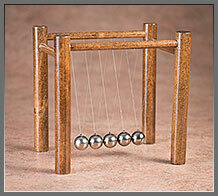 Other cradles are made of wood and/or plastic which break over time, and are not very appealing to the eye. 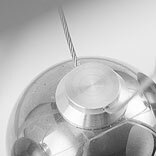 The caps that attach the cables to the spheres are also made of 6061 T-6 aluminum and affixed using a proprietary application process to ensure that the spheres will never become unattached. 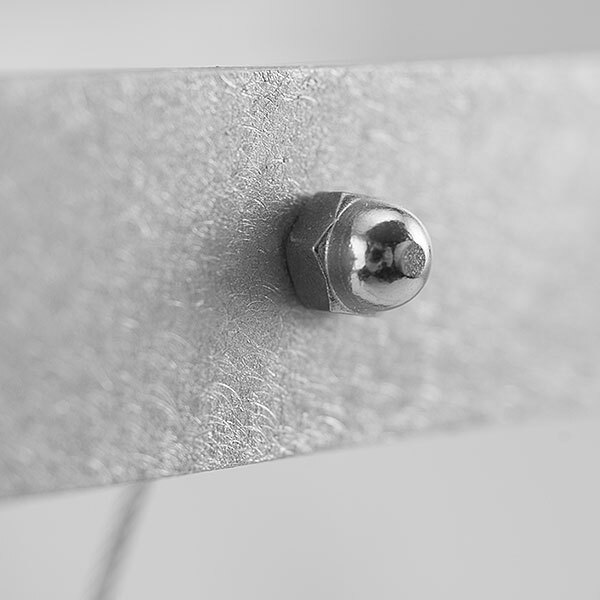 Galvanized steel aircraft cable is used primarily in aircraft mechanical applications and has a relatively high tensile strength. 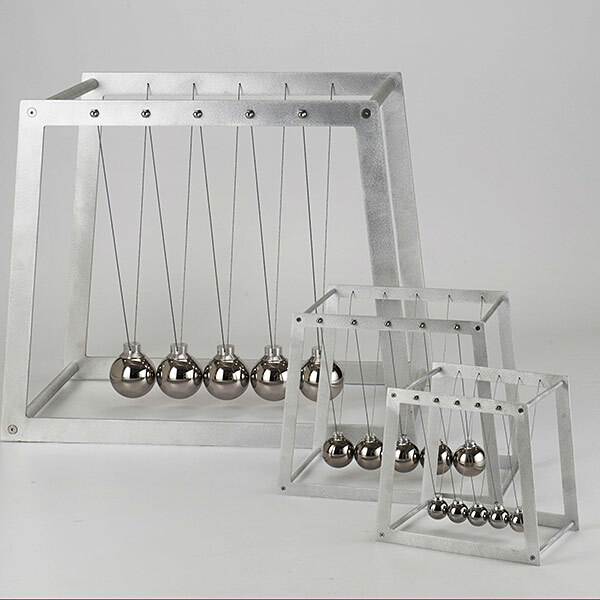 When used for suspension in the Newton's cradle it provides minimal transfer of energy thus allowing optimal energy transfer to take place between the spheres. 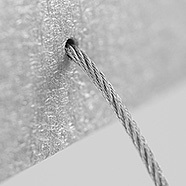 Because of its high tensile strength cable, you can be assured that it will not tangle or break. 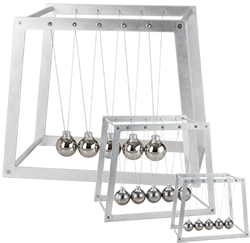 The problem with Newton's Cradles on the market today is the use of fishing line or string which tangles and breaks easily. 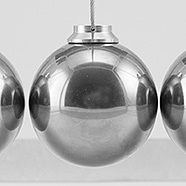 Nickel plated chrome steel spheres have exceptional surface quality and high hardness as a result of thorough hardening. 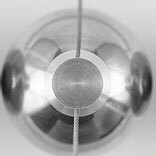 Nickel plated chrome steel spheres also offer long life and deformation resistance. 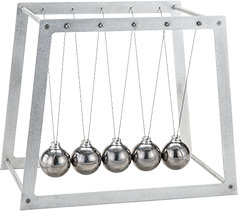 Because nickel plated chrome steel spheres possess a hardness rating of 60 on the Rockwell "C" scale, you experience incredible energy transfer when the spheres strike each other. 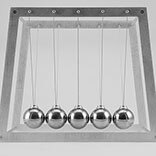 The high percentage of energy transferring then results in longer swing times. 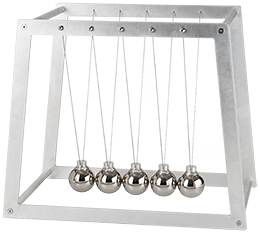 Our Jumbo Giant Cradle uses 4 inch nickel plated chrome steel spheres that weigh 10 pounds each. 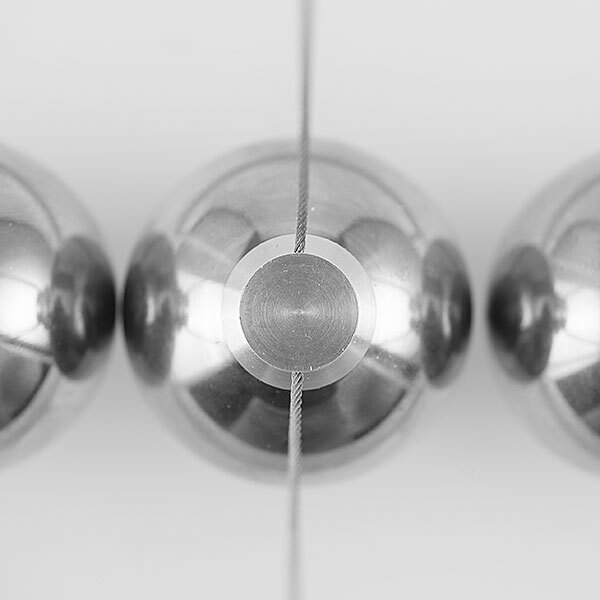 Our Giant uses 2 inch nickel plated chrome steel spheres that weigh 1.5 pounds each. 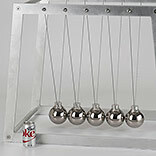 Our Giant Junior uses 1.5 inch nickel plated chrome steel spheres that weigh about .5 pound each.